Contest winners Penn Manor High School from Millersville, Pa., pose with their team advisor, Brian Osmolinski in front of the Raytheon pavilion. 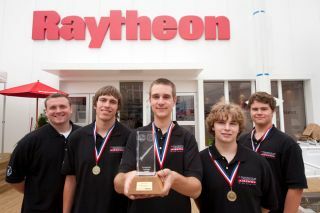 Raytheon sponsored the team’s trip to England to compete in the Transatlantic Rocketry Challenge. Team members are: Brendan Stoeckl, Jordan Franssen, Nate Bernhardt and Tyler Funk. A smallrocket built by a team of American students from Pennsylvania soared into firstplace in an international contest held Friday in Farnborough, England ? helping the students becomethe first U.S. team to win the high-flying event. Thefour-member team from Penn Manor High School in Millersville, Pa., posted thebest score to win a trophy, individual medal and bragging rights at the ThirdAnnual Transatlantic Rocketry Challenge at the 2010 Farnborough International Airshow. They beat out other student rocketeers from France and the United Kingdom. "Weare so excited that we won," said Penn Manor team member Brendan Stoeckl. "We succeeded because of practice, good data analysis and teamwork." Secondplace went to a team from Horsforth School in Leeds, England, while technicaldifficulties prevented the French team from being able to launch its rocket,contest officials said. Theinternational rocket contest is the culmination of three separate competitionsheld throughout the year: the Team America Rocketry Challenge (TARC), the United Kingdom Aerospace Youth RocketryChallenge (UKAYRoC) and the French Rocketry Challenge. Eachindividual contest brings together teams of middle and high school students, and tasks them with designing, building and launching model rockets. Forthis year's Transatlantic Rocketry Challenge, teams had to launch a rocket thatreaches an altitude of 825 feet (251 meters), stays airborne for 40 to 45seconds, and returns a raw egg payload unbroken. Teamsalso had to give an eight-minute presentation detailing their rocket design infront of a panel of international judges. This presentation was factored intothe teams' final score. Therocket challenges are sponsored by the Aerospace Industries Association and theNational Association of Rocketry in the U.S., ADS (part of the UK AeroSpace,Defence and Security industries), Tri Polus Ltd., Space Connections and theRoyal Aeronautical Society in the U.K., and GIFAS (a French aerospaceindustries association) and Plan?te Sciences in France. Theprograms are designed to encourage and motivate students to pursue careers inthe field of aerospace. "Basedon today's competition, the future of our industry is looking pretty bright," said Marion Blakey,president and CEO of the Aerospace Industries Association. "The level ofenthusiasm of the participants is phenomenal, and each team deservescongratulations for winning their home competition and inspiring otherstudents."